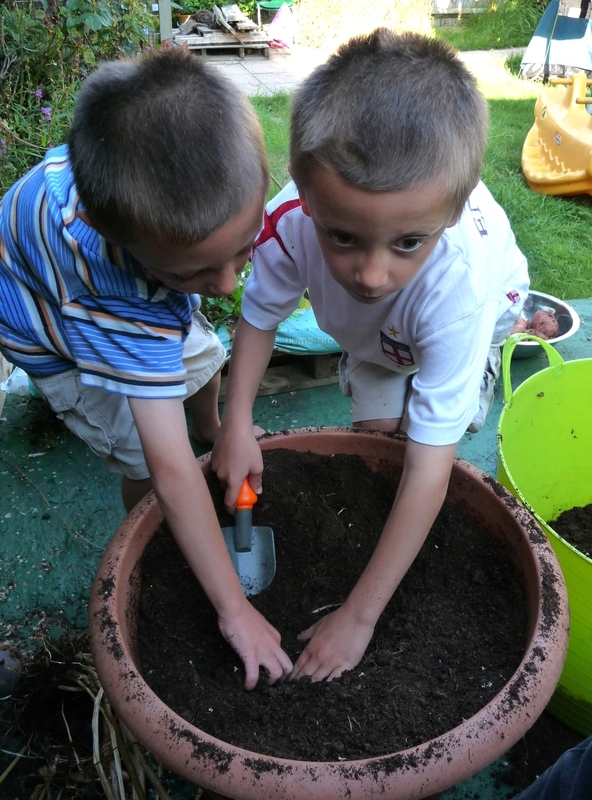 There are several fun gardening projects to try with kids that will both entertain them, and provide a good educational opportunity about the basic building blocks of life. With very little effort you can help your kids to create their own imaginative gardens with just some everyday household items & kitchen scraps. Kids get a kick out of watching plants grow from old plant parts, and you won't have to hear them complain of boredom when it's time to unplug those electronics! To start, all you need is to buy a bunch of celery, cut off the bottom of the bunch, then stick it in water. Watch your kids be delighted to see growth in a matter of days! But that's just the start, once it roots, you can plant the celery bottom in a container or in your garden and grow celery or celery leaves, which are great for cooking. 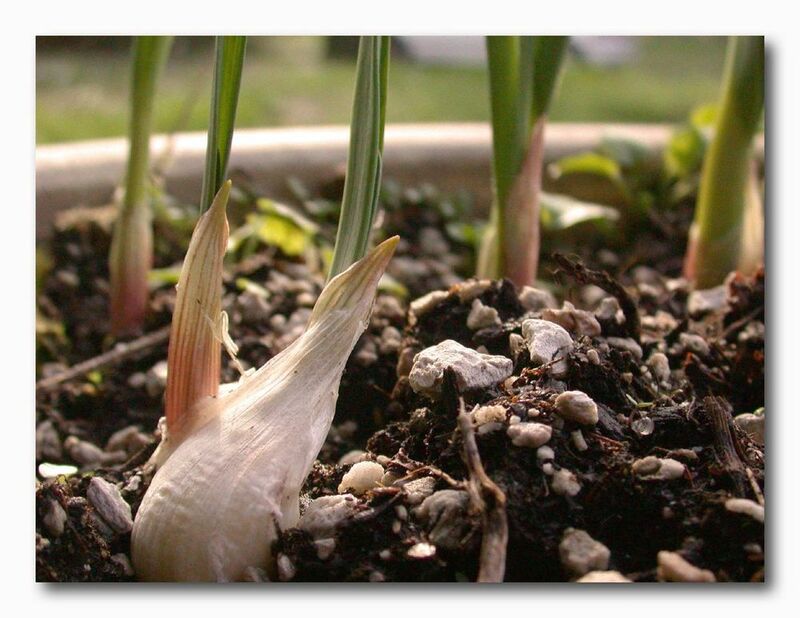 Plant old cloves of garlic just below the surface in containers filled with moistened potting soil. Have patience as it will take few weeks to see sprouts. Fortunately it is worth the wait, because once the shoots emerge they grow quickly, and you can eat these greens in salads and stir-fries. 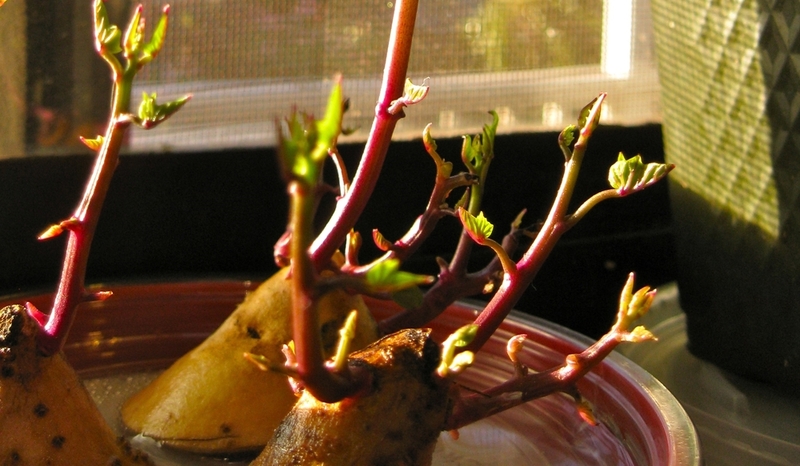 By simply submerging half of a sweet potato in water, you can produce a really cool plant. Plus, you can eat the young leaves and stems and they are really tasty! Start by propping a sweet potato over a water-filled glass by poking three toothpicks evenly around the middle of the tuber. Rest the toothpicks on the rim of the glass so that the narrower, pointed half of the tuber is submerged in the water. Place the glass in a sunny window. 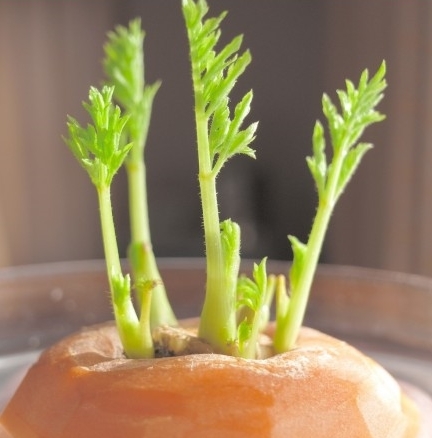 Soon roots will begin to sprout from the portion in the water, and within a few weeks, stems and leaves will begin to grow from the top of the tuber. To keep your sweet potato as a houseplant, carefully transplant it into a container of potting soil once a good root system has developed. Begin by breaking an egg open, clear out the contents, and gently wash and dry it. Then take an eggshell and make a drainage hole by poking a hole in the bottom with a needle. For a fun and decorative twist you can paint/draw faces or designs on your eggshells. Next place the prepared eggshell in the bottom half of an egg carton. You then fill the eggshell with potting soil (about three-quarters full) and drop in 2 or 3 seeds such as oat or wheat grass seeds, store-bought seeds, or small ferns and violas look beautiful. Finally, cover them with more potting soil, and place the egg carton in a location that receives bright light. You have to keep the soil moist and the easiest way to do this is with a spray bottle of water. The seeds sprout pretty quickly. You can even plant the young seedling and its eggshell container directly in the garden if you'd like. The seeds in oranges, lemons, grapefruit, and limes are easy to grow into new houseplants, and the leaves smell like whatever type of citrus you're growing! Simply fill a 4-inch-diameter pot with moistened potting soil. Remove whole seeds from the fruit and let them dry. Plant three to four of them one inch deep in the pot. The seeds should sprout in two to four weeks and you'll have a mini citrus orchard! Keep the seedlings well watered for about six weeks and then transplant individual trees into bigger pots. It will be quite a while before you see citrus flowers, and these trees won't bear for many years, if ever. But watching the citrus sprouts grow into little trees is magical for kids to watch and be a part of. 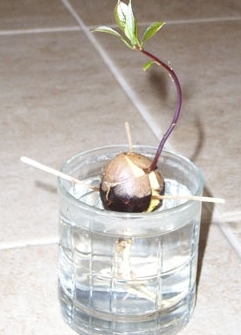 You can try growing big seeds too, like those from avocados. Start by poking three toothpicks around the middle of an avocado pit. Suspend the avocado pit with the root side down (the broader side) over a dish by resting the toothpicks on the rim. Add water until it just touches the bottom of the pit. Place the dish in a sunny window, and change the water every few days to keep it fresh. Kids can watch the roots and sprout emerge. Cool! Note that it can take a month or two for roots to appear. Once it has fully sprouted with roots and leaves, then you could replant the pit in moistened potting soil, keeping the pit only half buried. Off With Their (Carrot) Heads! Slice off the head end along with one to two inches of the root and place it in a saucer filled with pebbles for support and water. In a week or so new greens should appear from the top. Then snug the root into a container filled with potting soil. Gardening with children, from toddlers to teenagers, opens new windows in a world seemingly ruled by technology. It's a chance to partner with Mother Nature to make magic! There is already a natural attraction between children and the earth, whether it's making mud pies, or discovering a sprouting seed emerge from the dirt. So "dig in" and grow something, even if it is just planting your indoor dish of sprouting celery stalk. If it's curb appeal or horticulture perfection you're looking for, then contact us at Living Expression Landscapes - 281-681-8715.